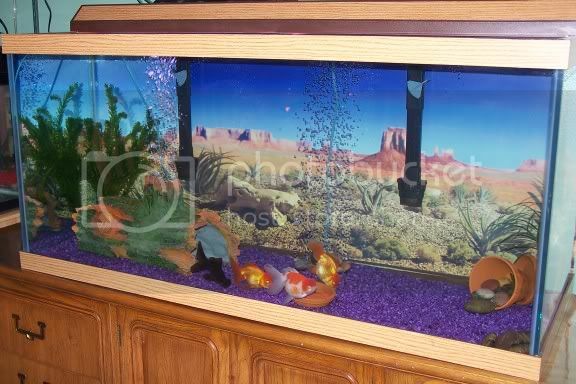 Goldfish is the big tank in the middle, 2 gal betta to the left and 1 gal betta underneath..
10 gal tropical on the window sill ...lol.. and 2 gal betta next to the tv, currently housing a torn up rescue from college. This 6 gal sat on the floor right now will be divided tonight and set up for the bettas tomorrow ..behind that tank is a fry tub, and on top is an empty tub.. used for whatever comes along! How many Goldfish:None right now, gone tropical. Nice tanks everyone! I gotta get the batteries recharged on my digital camera! Hey Mark, is that Koko's I see on that monitor? It's always fun to see eveybody's pics! Here are a couple pics of my 80 gal! You can see the end of my 20 gal tank on the right side of my 80 gal. I have been trying to find a new little goldfish to put in the 20 gal, as it sits empty, but have not had any luck finding one that looks healthy! lol Mark122 i can see my manatee siggy on your monitor! Gorgeous tanks! I would post mine but I'm just in a rental(currently house shopping) so the placing is not very exciting. Hopefully once I move I'll have lots of pretty pictures too! which one?? ive changed the pic if you were referring to mine, that is Coco my 10 year old oranda that had to have put to sleep last tuesday. the new pic shows more how cluttered it was. My fish-room in the basement! Here are my 6 tanks. Theyre all in my living/dining room. On the right are my 10 gal tropical tank and 7 gal QT/betta tank. On the left are my 30 gal goldie/snail tank and my 30 gal turtle tank. Closer view of the 10 gal tropical and 7 gal QT/betta tank. 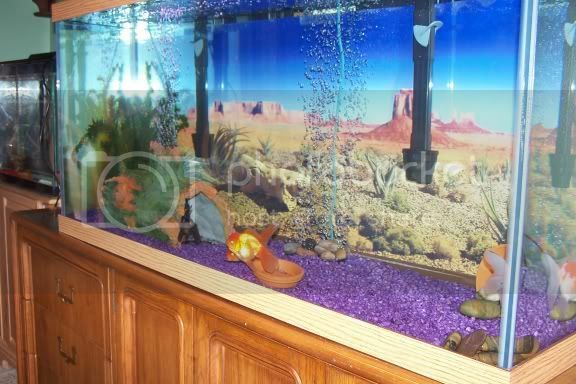 Closer view of goldies and turtle tanks. Across from my 2 30's are my 55 gal goldie tank and 30 gal cichlid tank. wow thats a lot of tanks glitterfish!! i bet you are very busy with water changes!! they all look very clean, and i like the layouts. Yeah it takes awhile to do water changes. I just spent about an hour doing it! I appreciate the compliments! lol, i take nearly an hour just doing one, you must be super fast! your welcome for the compliments. i like my new tank setup, less clutter, more swimming room how it should be!! Ooohh yeah your new setup looks awesome. Lots of swimming room!! Hmm, I didnt know I was that speedy but I must be. lol. The barebottom saves a lot of time for me though. yer, barebottom is easier i suppose, when i gravel vac i have to be careful, with two weather loaches that like to hide in the gravel!! dont want to be sucking them up. i like the live plants, and my gf seem to leave them alone, its the hillstream loach that i have seen sucking on them recently!! silly thing.